The key to this dish is simple–good strawberries. I have the pleasure of having access to Harry’s Berries: a local farm/institution that sells at farmers’ markets throughout Southern California. They grow many varieties of strawberries, but the best in my opinion is their super sweet Gaviota Strawberry. That’s what I used here, but any ripe strawberries will do the trick. The strawberries and vanilla bean will provide plenty of flavor and your ice cream maker will do all the work. 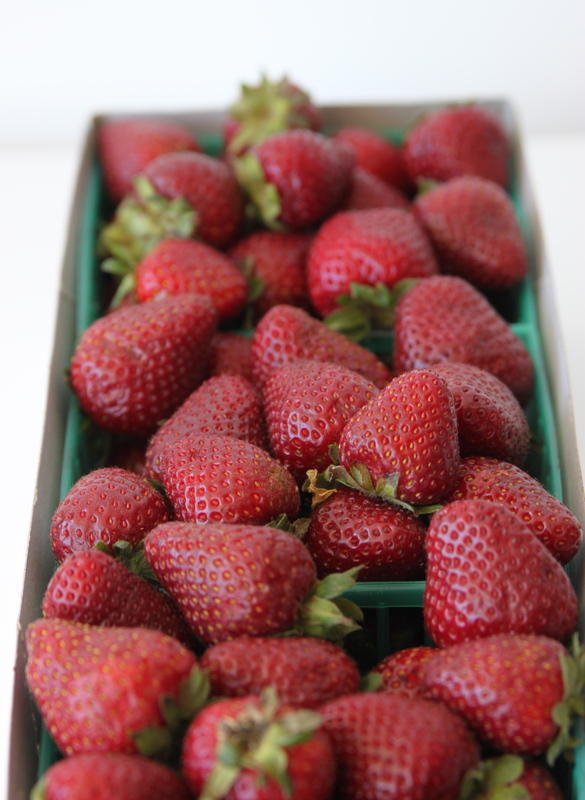 Gaviota strawberries are a little bit smaller than conventional berries, but pack an obscene amount of flavor. Mash the strawberries down with a fork so that you have some juice to work with. 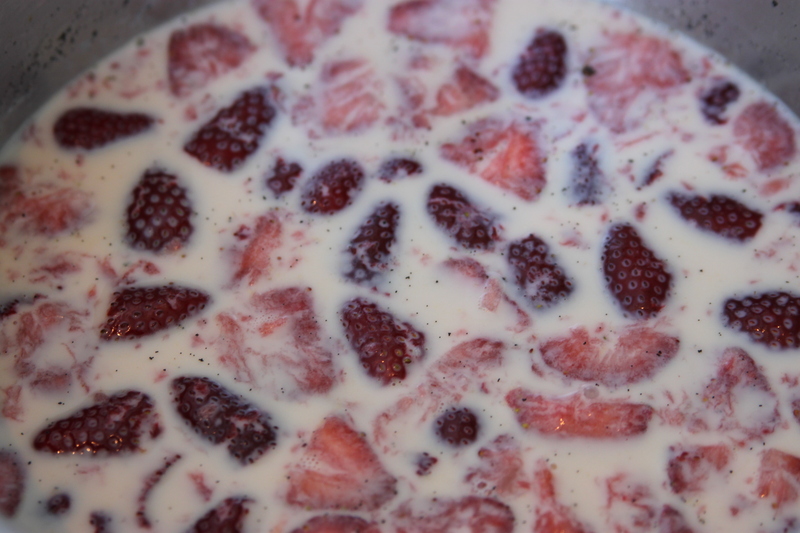 Add the berries to the milk mixture when still warm to get some extra flavor out of them. You also want to add some color so that your gelato is properly pink–thus, don’t worry about the strawberries cooking just a bit. If your ice cream maker has a gelato paddle or setting, use it! 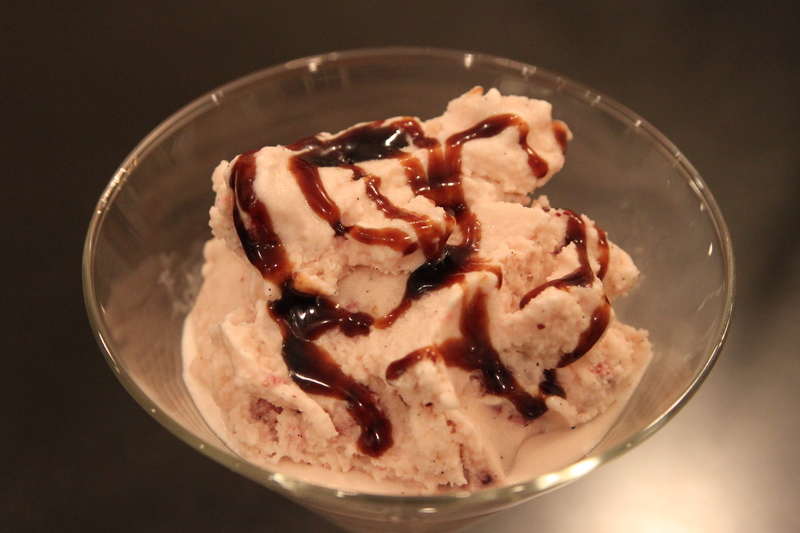 I added some organic balsamic creme to mine as it was served at a dinner party. 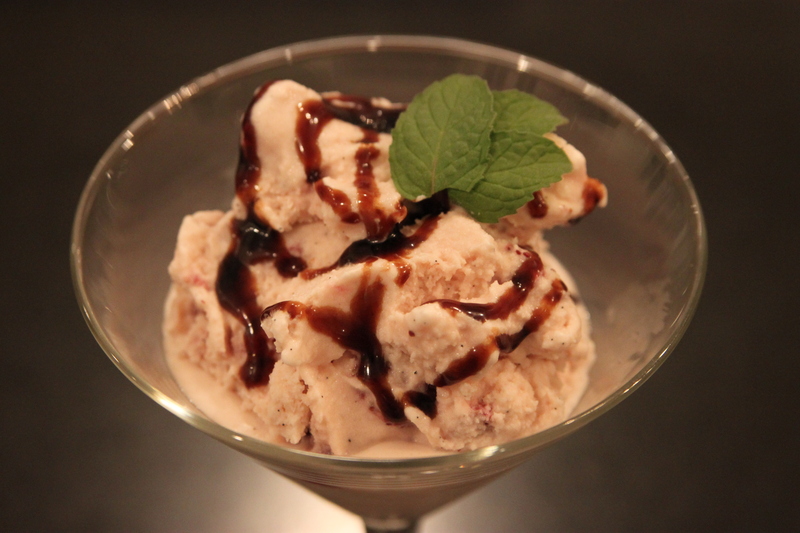 The balsamic adds a different flavor component that pairs very well with the strawberries. Garnish with fresh mint if you have it. Enjoy this dessert, it won’t last long. 1) Add milk and cream to a medium sized sauce pan. Then, cut open the vanilla bean pod remove the interior vanilla beans using a small spoon or butter knife. Add the vanilla beans to the milk and mix well with a fork. Then add the entire pod to the milk and cream–there is still a lot of flavor in there so always let it simmer and throw it away later. Turn the heat to medium-low and let simmer stirring every so often. 2) While the milk is simmering, beat the egg yolks with the sugar in a mixing bowl. You just want it to begin to get fluffy and for the sugar to become a part of the yolks in a uniform manner. I use a fork for this and beat the mixture for about two minutes. 3) Once the milk is hot but not boiling, slowly pour in the eggs and sugar mixture while stirring vigorously. Do not pour the mixture in extremely quickly. Do not let the pan get so hot that the yolk will instantly cook. You just want to pour the sugar mixture slowly into the simmering milk mixture. 4) Let the mixture simmer until the sugar is completely dissolved and it has slightly thickened. Then remove from heat. Remove the vanilla bean pod. You don’t want the mixture to boil but a good simmer will get the vanilla flavor going. Plan on 20 minutes total. 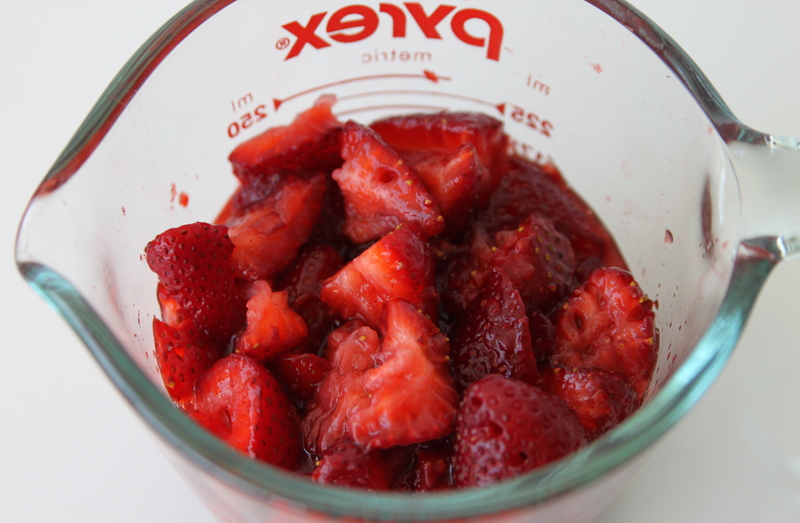 5) Wash about 4 cups of strawberries–you will need 2 cups of smashed strawberries. Remove the green stems, then cut into halves and quarters. Place in a measuring cup and mash them with a fork. There is no science to this–some pieces should be more smashed and other pieces should have their shape. You are really going for the juice. 6) Once the strawberries are mashed, pour them into the warm milk and vanilla bean mixture. Stir well. Place in the refrigerator for 2 hours to let cool. 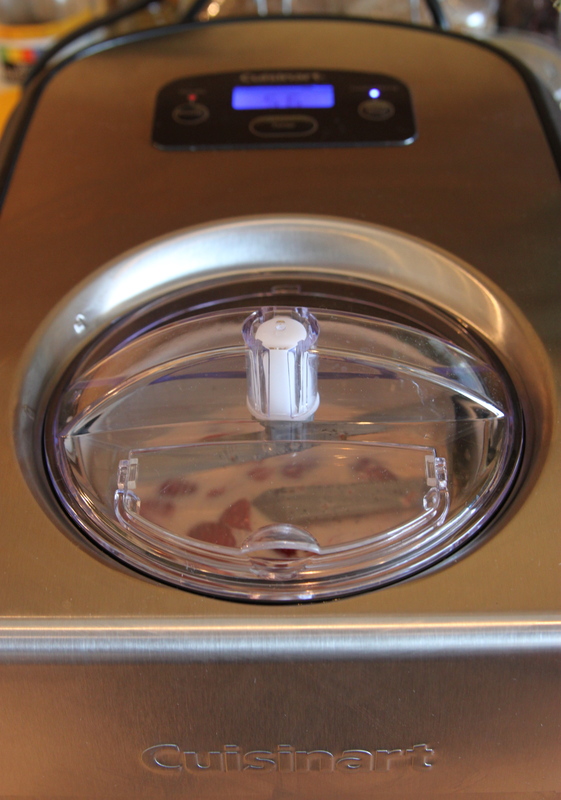 7) Pour the milk and strawberries into the ice cream maker. Set for about 45 minutes or until firm. Serve and enjoy! 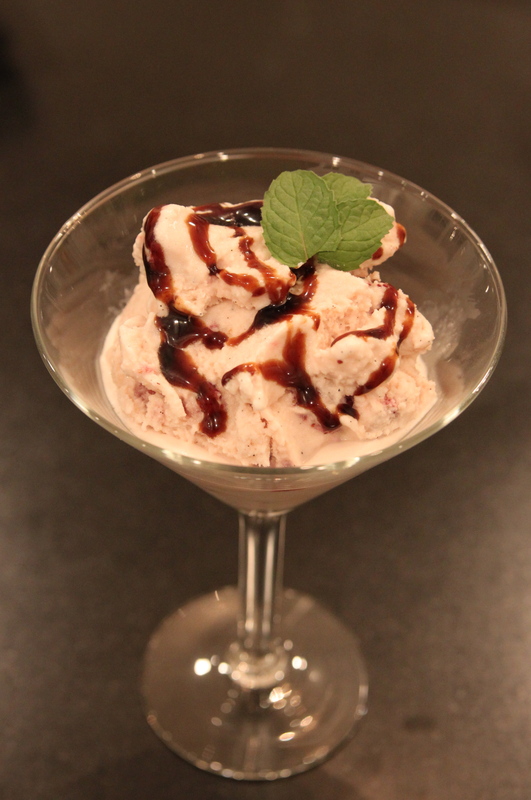 8) If you want, you can make your own balsamic creme. But, I just buy mine at the store.